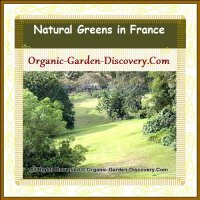 An organic garden diary can constantly show you ongoing special and practical do-it-yourself gardening tips is here! I love natural gardening since I was very young. Those days we stayed in a flat. We had only a small window balcony to do our gardening. We had first a lemon tree and a chilli plant. Later we managed to grow a cherry tomato plant near a window; around the corner of our sitting room. I remembered I helped my mum to catch those green worms and monitor the growing progress everyday. Home gardening is full of fun and joy! Imagine... the moment you feel the fresh fruits from your own work, it is simply exciting! 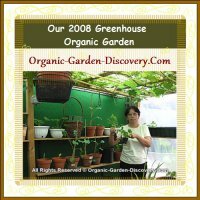 The above image is our small green house garden nursery. Here I do all our organic gardening projects, research and monitoring the insects pests behaviours. 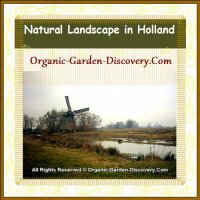 The above image is our favourite nature spot in Netherlands. Here you can relax and enjoy the peace of nature, the great windmill and the beautiful water pond; and the essential landscape. These days, I have my own garden. I have been trying out ways to grow plants differently. Chemical free garden is not new to us; we had never thought of any other better way to grow plants than growing them in their natural way. Plants have given us all their beauties and love, therefore we should love them and care for them too. My friends were asking me all these while; what is our top secret to grow a simple, weed free and pesticide spray free garden. I promise to show you all our gardening experiences in our upcoming gardening magazines. The above photo is a pure evergreen slope in France. Here you can feel the calm and the peace. 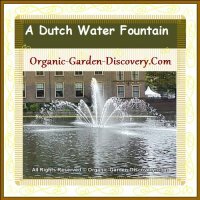 The image above is a water fountain in Holland. Here you can receive the fresh; cool; and joy. And soon you can turn the impossible into possible. With your own budget and standard; and some assistant from our great natural resources; you can do it effortlessly. You will learn ways about creating your own unique garden atmosphere from the front yard landscaping ideas to the backyard small garden designs with your talented self-designed colourful flower borders, DIY backyard gardening, home yards water gardening and more. Join us to build a whole year round pest free harmony garden from today?